Of course, you have Mendelssohn (born in 1809), Schumann (1810), Liszt (1811), Wagner (1813), Bruckner (1824) and Brahms (1833), the towering masters of Austro-German romantic music among those born in the first fifty years of the 19th Century (Liszt by establishment in Weimar and membership of the Wagner circle rather than by birth). And then you have the throng of now obscure “minor” composers, Norbert Burgmüller (1810), Ferdinand Hiller (1811), Sigismund Thalberg (1812), Julius Rietz (1812), Robert Volkmann (1815), Gustav Nottebohm (1817), Friedrich Kiel (1822), Joseph Joachim Raff (1822), Theodor Kirchner (1823), Carl Reinecke (1824), Albert Dietrich (1829), Julius Reubke (1834), Felix Draeseke (1835) and even Max Bruch (1838) who, other than his Violin Concerto, arguably remains one of these obscure and minor composers, Joseph Rheinberger (1839), Friedrich Gernsheim (1839), Hermann Goetz (1840)… and I’m probably forgetting many (there’s no end to obscurity and minority), and I could go on chronologically. But I’ve found lots of satisfaction in the works of those minor composers. Oftentimes I’ve found their chamber music to be not strikingly inferior to the similar works of the “major” composers (and when it comes to chamber music, these are, really, limited to Mendelssohn, Schumann and Brahms), Nottebohm’s Variations on a theme of Bach for two pianos, which he often played with Brahms, sound like a piece Brahms could have written, and while the symphonies of Volkmann or Bruch may not be equal to those of Brahms, and they may give you the impression of music that you’ve already heard before, still they are not entirely inferior to Schumann’s I find and offer much reward. So I’m always game for the exploration of the music of any of those (now considered) “minor” composers of the romantic era. Draeseke is one of them and his dates make him a near-contemporary of Brahms (he survived him by 16 years, until 1913), but in the fierce war that opposed back then the “classicist” Brahmsians and the modernist Wagnerians, he placed himself in the second camp, which didn’t prevent him from writing classically-molded symphonies. But with all that, I find it hard to muster much enthusiasm for the two works gathered here. 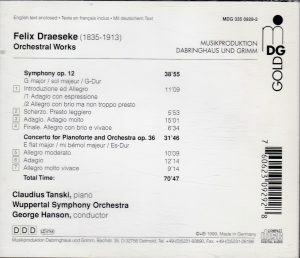 In the Symphony – his first, out of four in all, and a large-scale work of nearly 40 minutes, completed in 1872 after, say the liner notes, several years of work –, Draeseke’s skill at writing for the orchestra isn’t in doubt. It’s his skill at writing memorable tunes that I’m not convinced about. The dynamics swell up and down but the unfolding lacks organic necessity, I find. The symphony traverses rather merry moods, rising at times to what I suppose is meant to be “heroic”, without much Wagnerian “angst” – if Wagner, it is the spinning chorus in Flying Dutchman, and hearing Draseke’s Symphony, one understands where Strauss might have found a model (the Strauss of Sinfonia Domestica, at least) -, and it sounds like a combination of Mendelssohn and Schumann, but without, to my ears, those twists which imprint their orchestral works in your memory. The scherzo was very successful at the time and even had a separate publication. It’s the kind of bubbly music that should produce great excitement.. in my case it’s only sympathetic interest. No match for the Scherzo of Mendelssohn’s Midsummer Night’s Dream. Draseke isn’t rhythmically very daring either: when you think of the rhythmic ambiguity Brahms could introduce in a 6/8: Draeseke’s 6/8 is very square and predictable, very comfy on the beat. Draeseke considered the slow movement “the most valuable number” in the Symphony. But whichever way I listen, with or without score (available on the International Music Scores Library Project, gratitude to whoever uploaded them), I don’t get a sense of continuity, of the long line, the cogent unfolding that you find in the slow movements of Brahms as in those of Bruckner, just an episodic construction, moving by spurts, bits and pieces put one after the other, gos and stops, and all that at the service of a melodic invention in which nothing leaves a mark. Some climaxes have a grandeur that could almot Brucknerian but aren’t quite, my attention may be attracted by this or that detail of rhythm or orchestration, which I will find interesting, but the interest remains intellectual, not emotional. There might be a kind of Mendelssohnian triumphant sweep to the Finale, but it’s heavier than Mendelssohn and doesn’t avoid bombast. Bombast is again the name of the Piano Concerto. It is a hugely demanding work, completed in 1886, running over 30 minutes, the kind favored by the piano virtuosos of the day but only by them, many notes but little substance that I can perceive, the piano pounds and pounds as if to hide under the din that it doesn’t have much to say. The worst comes at 7:44 in the first movement when Draeseke’s pervading and tritely jaunty rhythm (he seems to have a fatal attraction for the dotted eighth note – sixteenth-note) is picked up by the trombone, making it sound like circus music or a march that would have been game for Charles Ives to turn it into a spoof. Sometimes, though, Draeseke touches target. The slow movement is a theme and variations, which I guess suits well the episodic nature of Draeseke’s inspiration, and indeed some of these episodes are beautiful, like the hushed and caressing carpet of strings at 1:30 that repeats the theme initially stated by solo piano – at 2:20, the piano re-enters for a first variation, and its over. At 4:02 there’s a fine contrasting passage, scherzando, with a bouncy and whimsical piano and witty commentaries of woodwinds – but at 4:49 Draeseke has had enough of it and jumps to a more solemn and bombastic variation where orchestra first dominates and the piano pounds a lot. That leads to a new variation, starting at 6:22, for solo piano, with a moment of trills in the low notes, at 6:53, very reminiscent of similar moments in the slow movement of Brahms’ first Piano Concerto. At 9:20 the solo piano scales from low to high register and the strings enter with the theme, soft, hushed, in their high register – something like Draeseke’s Lohengrin-Prelude or Parsifal Overture, very beautiful. At 12:10 the movement is over. The Finale should give the impression of being boisterous, gay and carefree, but again I hear mainly the bombast and trite melodic invention. Now, to define precisely what it is that makes a great tune (Beethoven needed no more than four notes to write one) and what’s lacking in well-crafted music to make it memorably tuneful, I don’t know. I don’t think it’s anything I’ve eaten this morning… and I’ve spent more time on this CD, listening and listening again, than I would have on music that would have immediately won me over. But it’s a subjective thing and others may react differently. In fact, they have. Writing in the March/April 2000 issue, esteemed Fanfare critic James H. North, while recognizing some flaws in the Symphony’s Finale (I personally don’t here more, or less, there than in the rest), called the CD “a beauty”, “a recording of extraordinary importance”, and the Piano Concerto “a real find”, and in the following May/June issue, Robert McColley was of the same opinion, calling the symphony “a powerful and original work by a composer who knew exactly what he was doing”. North’s observation that Draeseke, although he saw himself as a modernist on the Wagnerian side, really had one foot in each camp, is perceptive, but the conclusion he infers from it, that “anyone who responds to music of Schumann, Mendelssohn, or Brahms is likely to enjoy Draeseke”… well… is not confirmed with this listener and great fan of Schumann, Mendelssohn or Brahms, at least not with these works. And as for McColley’s advice that “those who can appreciate the elaborate and intense symphonic designs of Bruckner, Elgar, and Mahler should investigate it” – sure, they should, but this fan of Mahler and Bruckner was not won over. 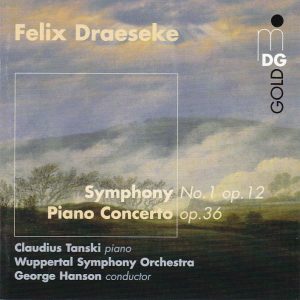 All the forces involved seem up to the dauting task of playing Draeseke’s music, but I have a few issues with the recording. Orchestral sound lacks a touch of clarity and brilliance at times, in the Piano Concerto the piano has a weak treble that makes it sound almost like a period instrument – and indeed, check the booklet’s credit: it’s a 1925 Blüthner, but I’ve heard old recordings from the 1920s and 1930s that didn’t have such flaws. Finally, minuscule clues let me think that the repeats of the scherzo are really that, repeats – e.g., the sound engineers simply cut and paste the first passages to make the repeats. Certainly a recording is an artefact, not the real thing, not the real acoustic instruments playing in your living room but the vibration of a membrane producing an imitation of that sound, so I can accept the artificiality of piecing together a recording, but really, it should be done in such a way that the artificiality is not perceptible. But I’m not giving up on Draeseke. Some works are slow to grow on you. In fact I’ve just ordered his complete symphonies on Cpo.